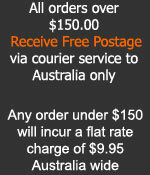 Dear Customers-Friends of Impact Nutrition Australia, all purchases and orders over $150.00 will be receive FREE delivery to anywhere in Australia, any orders less than $150.00 will be charged a delivery fee of $14.40 flat rate fee which includes $2.95 for signature post. Please also note the signature post fee cost of $2.95 will be charged on every single order as this means your order will need to be signed for but will reduce the chance of your order going missing. Impact Nutrition Australia can not take responsibility for missing parcels and therefore we will not post out orders without registered post as it is to cover you our valued customer. Samples of different Reflex Nutrition products, Alpha Gen3tics, Total Science Nutrition and Switch Nutrition (depending on stock levels) will be included in your parcel as we want to go that extra mile to not only make you happy but just to share a gift with you! We do not inflate our prices in order to make up for postage at all and in fact you can all see just how AMAZING the Impact Nutrition price structure is and not to mention that you just can't compare the quality of our products. PLEASE NOTE: Impact Nutrition will NOT take responsibility of orders that may go missing via normal postage (we will always provide a receipt proving the parcel left) so for Registered post, we just charge you the surcharge and once again you will get a receipt for it.